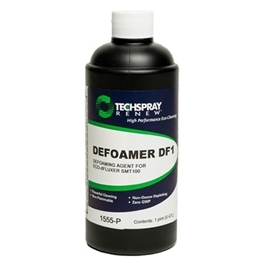 Leveraging over 40-years experience in electronic cleaning, Techspray offers a full line of water-based defluxers and stencil cleaners. These powerful cleaners allow you to reduce overall operating cost by increasing throughput, lowering concentration, and/or lowering wash temperature. Eco-dFLuxer cleaners are water-based, environmentally friendly and designed to work in both inline and batch cleaning equipment. They are optimal combinations of solvents and saponifiers that lower surface tension for penetration under low stand-offs, and powerful cleaning action to remove all flux residues. Effective on a wide variety of solders and fluxes: lead, lead-free, aqueous, RMA, no-clean, and new halide-free fluxes. High compatibility with common PCB metals and plastics. Eco-dFluxer cleaners are highly filterable with long bath life. Eco-Stencil cleaners are effective non-flammable drop-in replacements for isopropyl alcohol (IPA) and other solvents commonly used for stencil cleaning systems. Unique water-based blends are effective at removing a wide variety of pastes and adhesives. DI water can be added to further dilute, if full strength is not needed. Eco-Stencil cleaners do not contain ionics, and will not leave contaminates that will change downstream process windows or lead to board failures. Eco-dFluxer and Eco-Stencil cleaners are fully compliant with CARB (California Air Resource Board) requirements. Also compliant with European REACH (Registration, Evaluation, Authorization & Restriction of Chemicals) and WEEE (Waste Electrical and Electronic Equipment Directive) initiatives. They do not contain RoHS (Restriction of Hazardous Substances) restricted substances, SVHC (Substances of Very High Concern) list substances, or halides. Got questions? Contact us and we'll answer your questions.